It’s been a bit more than a week since my husband and I got back from a 5 day trip to Walt Disney World. We had a great trip, and I also wrote a blog post about Organizing your Time with the New FastPass System at Walt Disney World. So you want to find the best healthy food at Walt Disney World? Me too! As always, staying healthy while travelling was important to me. This post is based on a mix of both vegetarian and vegan options around the parks. In addition to the places that I mention in this post, there are other great resources on the internet that give good overviews. However, I wanted to get into a bit more detail about the options that I thought were noteworthy. For a good overview page, check out Vegetarian/Vegan Counter Service Meals from AllEars.net. They have a great overview chart that lists the vegetarian and vegan options by park. I made a boo boo on this trip. We stayed just outside of the parks this time around, and we rented a car. I thought that we’d be able to find a good grocery store but it proved to be more challenging than I expected. The last time that we went to Disney, we stayed onsite at Disney’s Caribbean Beach Resort and ordered groceries online from www.GardenGrocer.com in Orlando. They were delivered directly to the resort and were waiting for us at the desk on the first day. I wish I had done that again this time. I highly recommend that you order groceries rather than trying to pick them up in person. Hands down, the best kept secret in any of the parks is the Roasted Sweet Potato for just $3.29 at the Liberty Square Market beside the Hall of President’s show. They’re completely hidden other than a small the last time I was at WDW. They weren’t visible but when I asked the cast member brought out a giant, perfectly roasted sweet potato. Butter comes on the side so skip it if you want to stay vegan, a little salt and pepper and voila! The best deal and tastiest healthy snack or meal around any of the parks. You can get a Greek Salad ($7.99) at Cosmic Ray’s. The good thing about the food at Cosmic Ray’s is that they have a toppings bar so you can bulk up your salad. Grab a seat near Sonny Eclipse to enjoy your salad while you watch his show. Reservations for dinner at the still quite new restaurant below Belle’s castle in Fantasyland need to be made months in advance. I’ve never been for dinner when it’s a full service restaurant but at lunch it’s possible to get a reservation. We didn’t think we’d be able to go there this trip but there must have been a cancellation because availability popped up on the Disney app for the mid-service lunch the night before. The way it works is that you’re given a tracking device. You order at the front and and then they bring the food to your table. There’s a terrific vegan Quinoa Salad with green beens, potatoes, olives, roasted bell peppers and tomatoes for $9.99. The West Wing is the coolest of the 3 dining halls; it’s a creepy room where the rose is on displayed and mood lighting. It’s a good meal for $10 Disney and the most complete vegan meal you’ll find at the Magic Kingdom. A short monorail ride away, you can opt for a more peaceful lunch at one of the 3 area resorts. On our last trip, we stopped in at the Kona Cafe at the Polynesian for lunch. The atmosphere in the actual cafe is nothing special but it was nice to look around the Polynesian. I had the Kona Salad – mixed greens, blue cheese, fresh fruit, red onions, smoked almonds with a citrus vinaigrette $8.49. It was a nice salad, but appetizer size. It Next time, I would ask for a larger salad and pay more. The best salad at Disney World is in the Land pavilion at Epcot. People talk about it all over the internet. It’s fresh, hearty, reasonably priced and delicious! 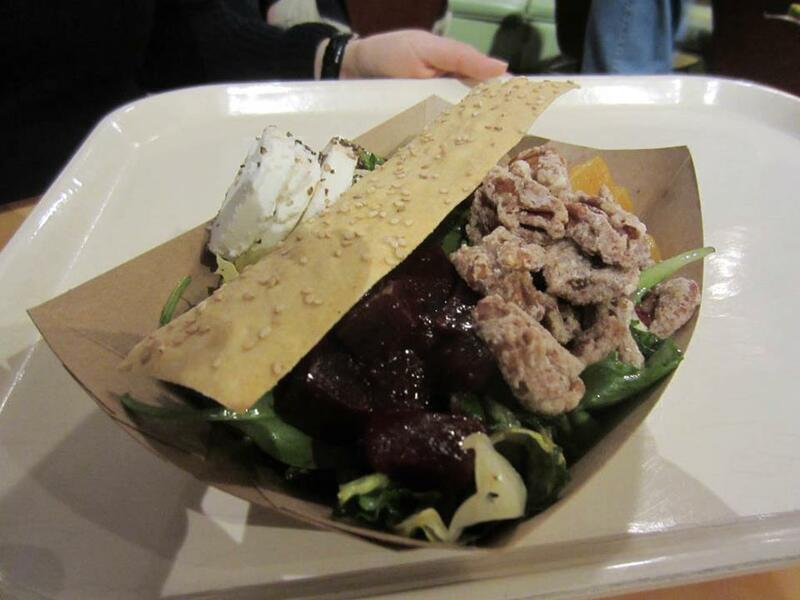 Not only is this a fabulous salad at Disney World, it’s an outstanding salad in “the real world” too. If you’re vegan you can have them skip the goat cheese and give you more beets or extra walnuts, though there’s honey in the dressing. 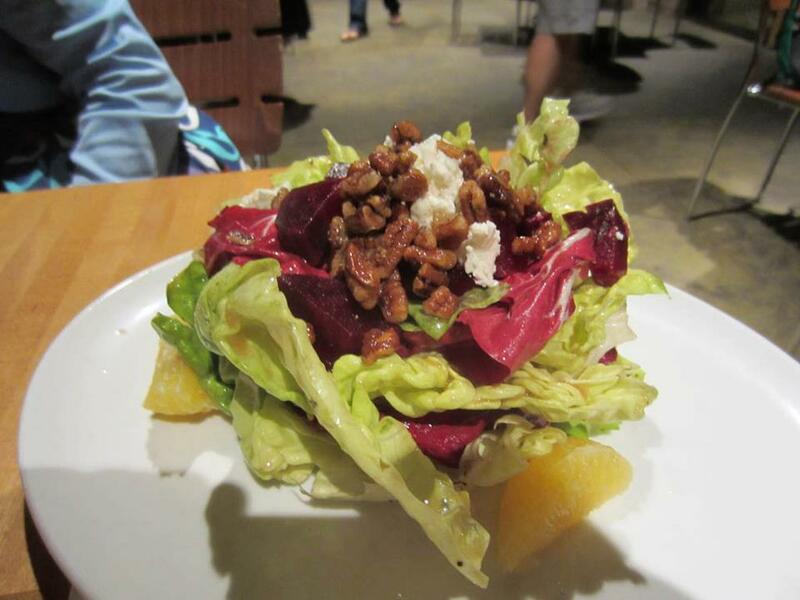 It’s listed as Roasted Beets and Goat Cheese Salad – with Honey Sherry dressing $7.89 but it’s also served with tons of delicious candied walnuts and a flat bread. 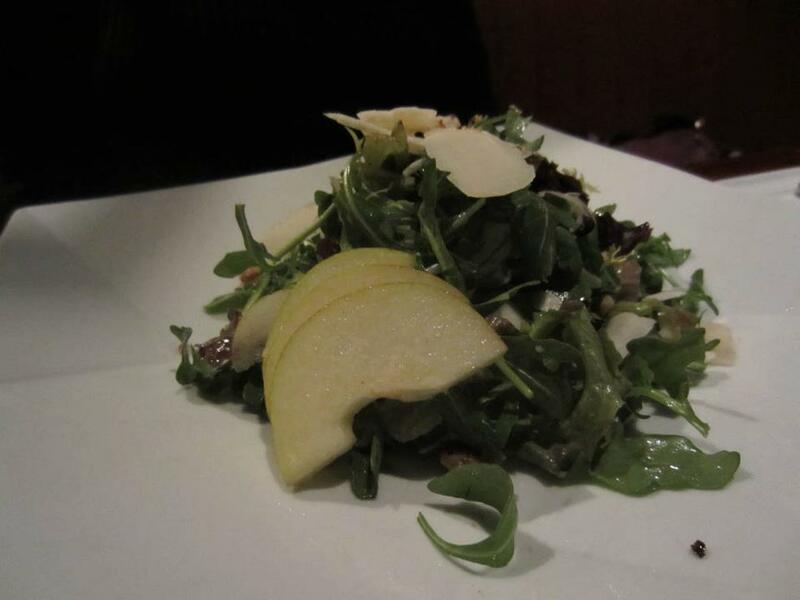 If you only eat one salad your entire visit, this should be the one. There are actually quite a few stands at the Animal Kingdom that have good vegan and vegetarian food options. I can’t find the name of this little kiosk but along the back route of the park somewhere near the Bird’s of Flight show there’s a vegetarian stand that sells edamame, salad rolls, fruit… I’m really impressed that there’s actually a stand that’s 100% vegetarian! It’s small, but the fact that it exists is promising. We had 2 orders of the cold salad rolls with peanut sauce. Great snack or small meal and I definitely felt good about supporting this concept. The options at some of the other stands looked good too. Check out Vegetarian/Vegan Counter Service Meals from AllEars.net for more details about the veggie quick service options at the Animal Kingdom. I would call this the best meal at Disney. We didn’t make it there this time, but we thoroughly enjoyed it last time. When we went, we might have gone a bit over board ordering appetizers as well as our meals, and they mixed up my order for the vegetarian sampler so they ended up giving me an extra dish of 3 options instead of 2. Long story, but I did get to try a lot at this place and I would definitely recommend it as the best healthy (and vegan) option at Disney. 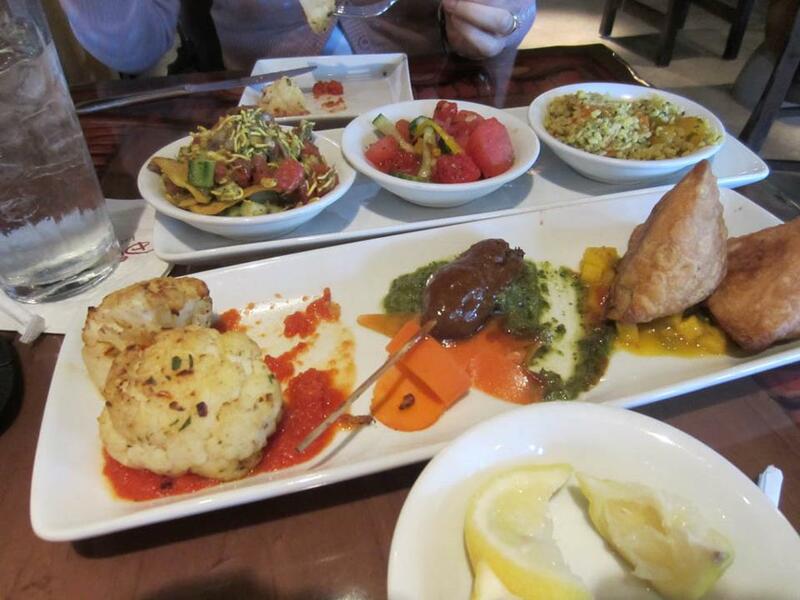 We started with the Sampler for Two – Potato and Pea Samosamb Kefta Kabobs, Roasted Cauliflower $14.99. I would actually skip this next time. My husband ate both the meat kabobs and I ate all the cauliflower, but the cauliflower was really nothing special. The samosas were nice, they seemed like they may have been baked because they weren’t oily. Mostly the mango salsa was the highlight. The salad sampler was better than this appetizer sampler. It came with a choice of 3 salads for $6.99. We had the Bhel Puri, Golden Lentils and Tomato and Watermelon, cucumber and fennel. The watermelon salad sounded more interesting than it was. Nothing special, so next time I would pass on that one but the other 2 salads were excellent. I’d opt for the beets next time as my third choice. This is where the mix up happened because my waitress took my order down wrong. As a result I was able to try 3 of the vegetarian options instead of 2. 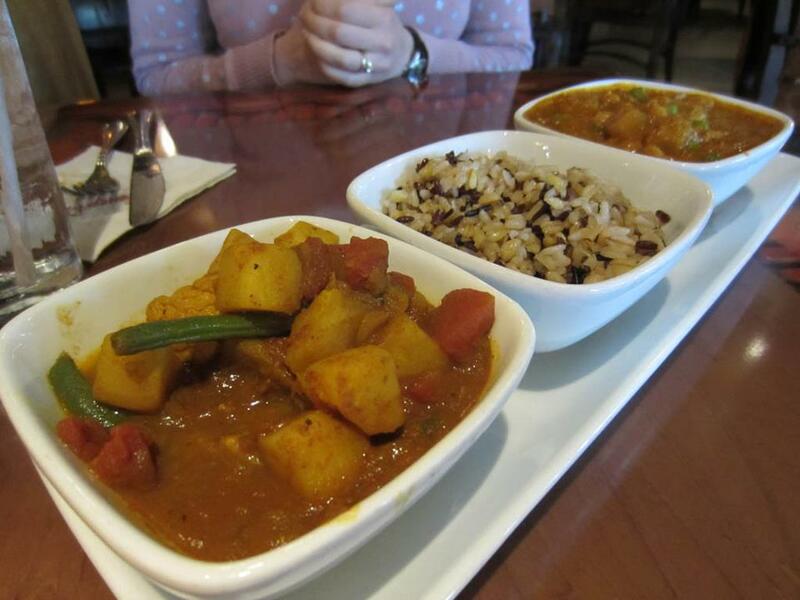 Along with the five-grain pilaf I had the Paneer Tikka (not vegan), Spicy Peas, chickpeas and potatoes (vegan) and Vindaloo-style vegetables (vegan). Let me tell you, it was pleasantly spicy! I like spice, but I was shocked that they actually made it that hot at Disney. It was a very filling splurge meal. We were so full we skipped dinner that night. I would go there again, and make sure to make it my main meal of the day again too. On our last trip we made reservations to go back to the Animal Kingdom Lodge for a nice Sunday dinner at Jiko. Jiko was very nice, but the food wasn’t as exotic as Sanaa. Still, it was a nice experience. They bring bread to the table with a fancy butter so I only opted to share the appetizer dips with my husband and have a salad rather than trying the full vegan entree on the menu. 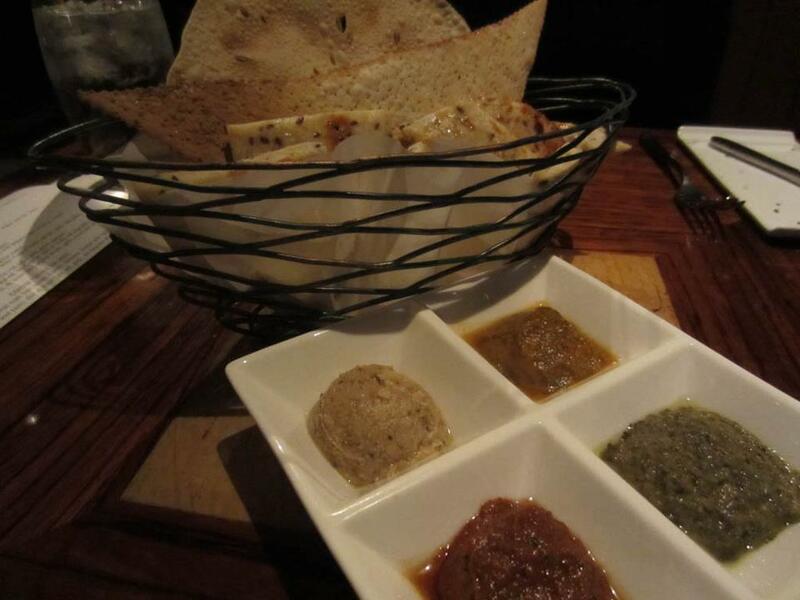 The dips were the Taste of Africa – African inspired Dips with pappadam, poppy seed lavosh and House-made Naan $9.00 which were ok but not really anything too special. It ended up being so many carbs since they had also brought the yummy bread to the table first. Then I had the Jiko Salad – bitter greens, frog hallow pears, spicy glazed walnuts, aged goat cheese and citrus vinaigrette $12.00 which wasn’t a huge salad but it was just right since I had already carbed out on the starters. I’m calling this mid-service because you order but then they bring the food to your table. We really enjoyed this option for a reasonably priced dinner the one night we went do Downtown Disney. 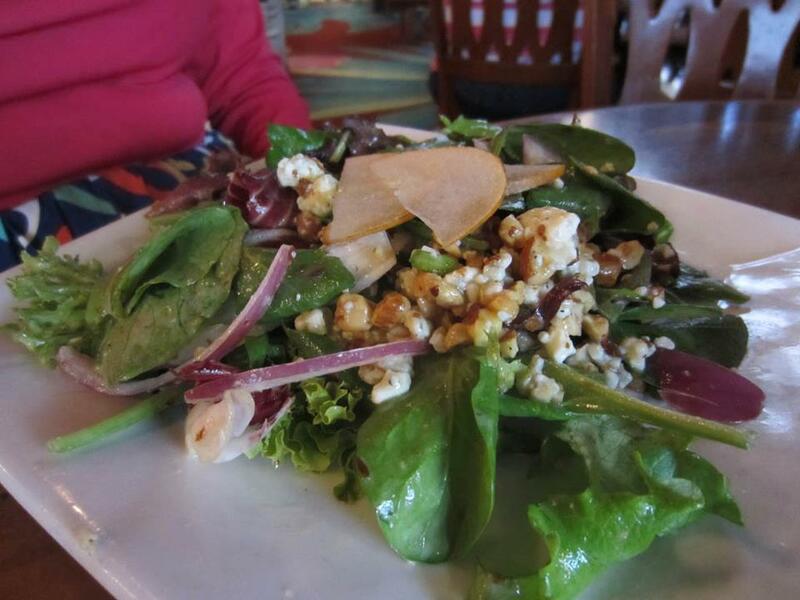 I had the Butternut Squash Soup – Roasted red pepper coulis and chives $5.95 and the Roasted Beets Salad – Goat cheese, oranges, fresh greens, candied pecans, balsamic vinaigrette $10.95. The soup was really delicious. 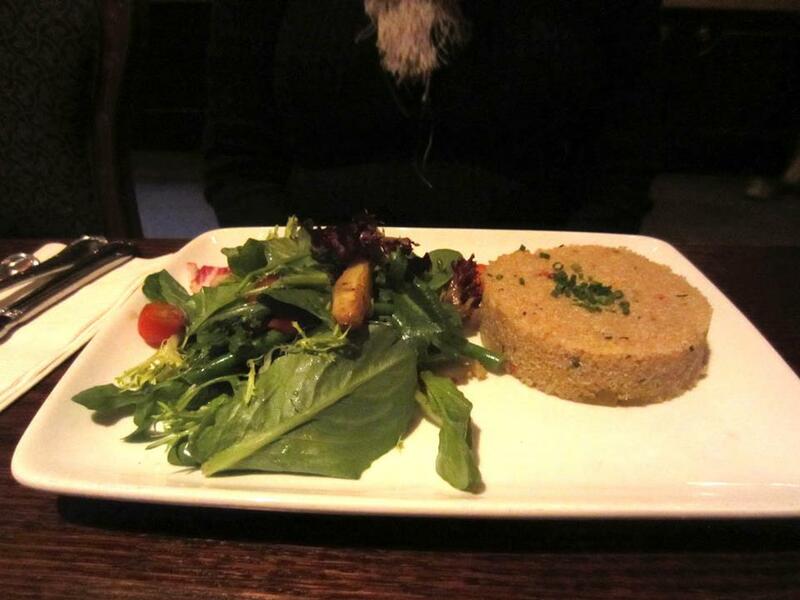 The salad was good too, but I’m glad that I had the soup because it wasn’t a particularly large salad on it’s own. Still, very tasty. 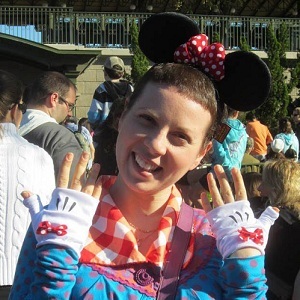 Have a great time at Walt Disney World! If you discover any great healthy food at the parks, please let me know. I’d love to hear about it before we go again… We’ll be back in another 3-4 years I’m sure.